A few months ago, Captain Cavedweller and I went to an Italian restaurant we had never tried before. 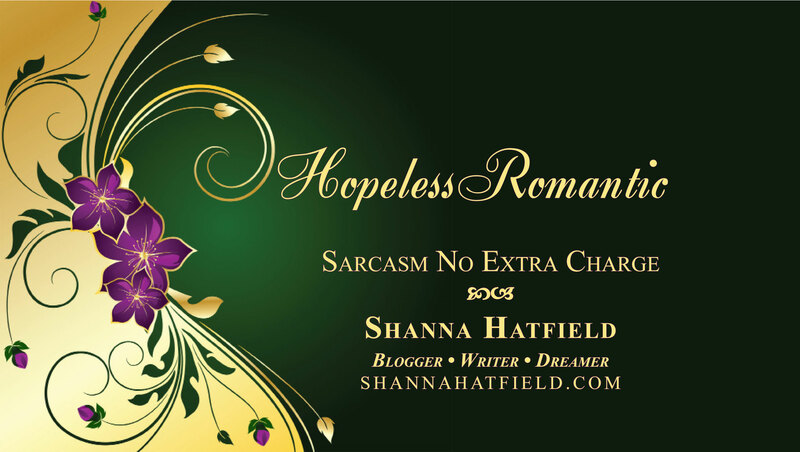 The atmosphere was quite lovely, the service top-notch and the food… was marvelous. CC decided to be adventurous and try something beyond lasagna or spaghetti (his two standard choices when we eat Italian). The other day I decided to try and make it at home. For those of you who make your own polenta and tomato sauce, I envy you, but will never be you. 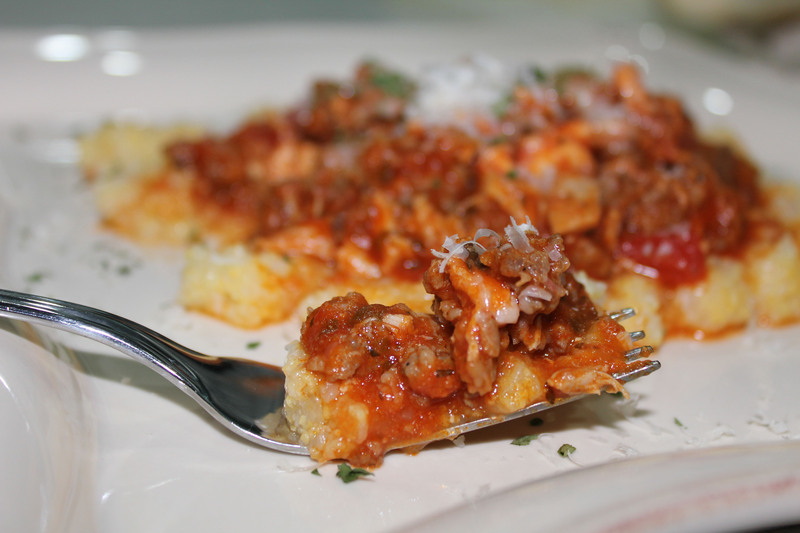 If sauce from a jar and pre-made polenta turns you off, you might want to skip today’s post. If you are someone who doesn’t mind a few easy shortcuts to a fast and fabulous dinner, you are going to love today’s post! We made two versions of it since I can’t eat the tomato sauce. So below you’ll find instructions for both the His and Hers version. 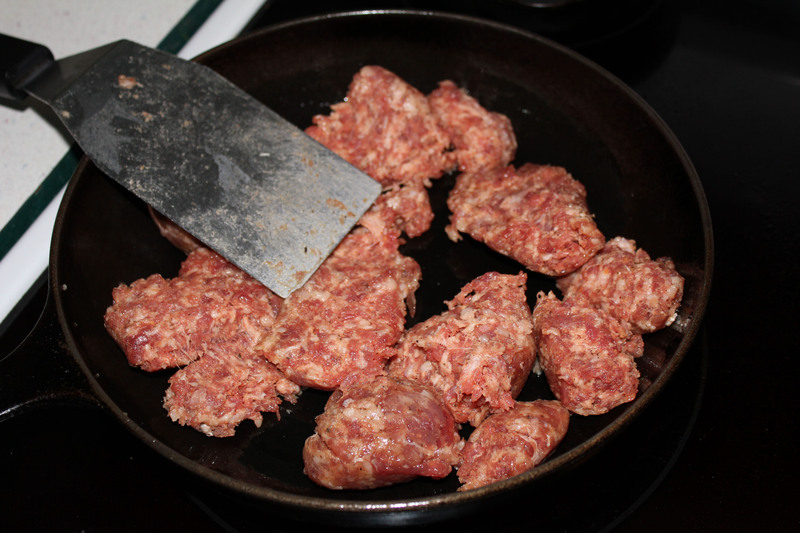 Brown Sausage in a heavy-duty skillet. 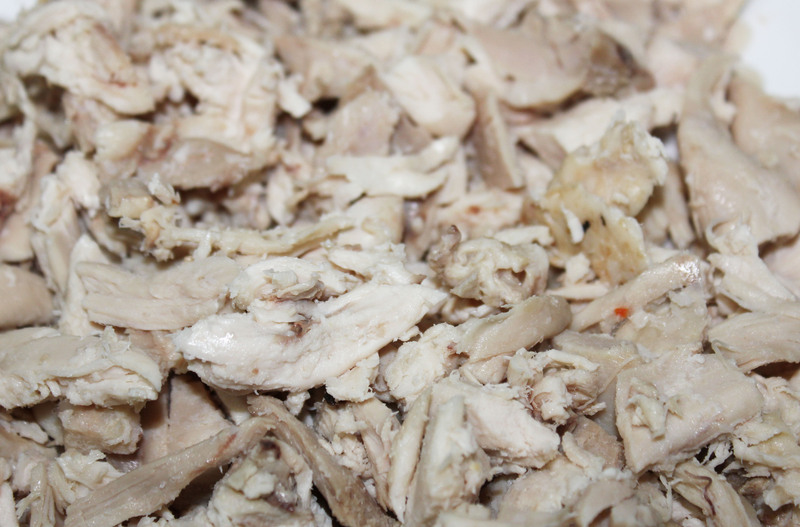 Chop cooked chicken into bite-sized pieces. I had leftover baked chicken that worked well. 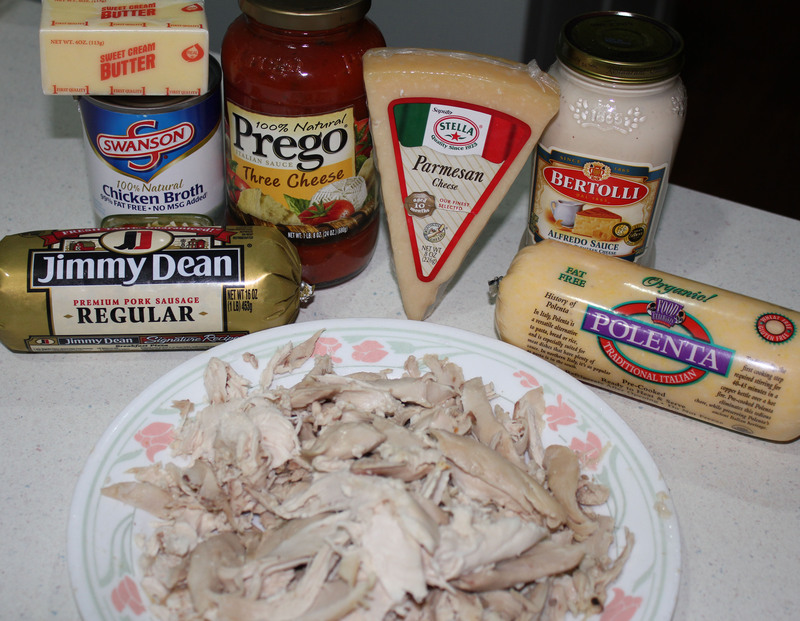 If you don't have pre-cooked chicken, you could purchase a package of grilled chicken pieces if you are really in a hurry! 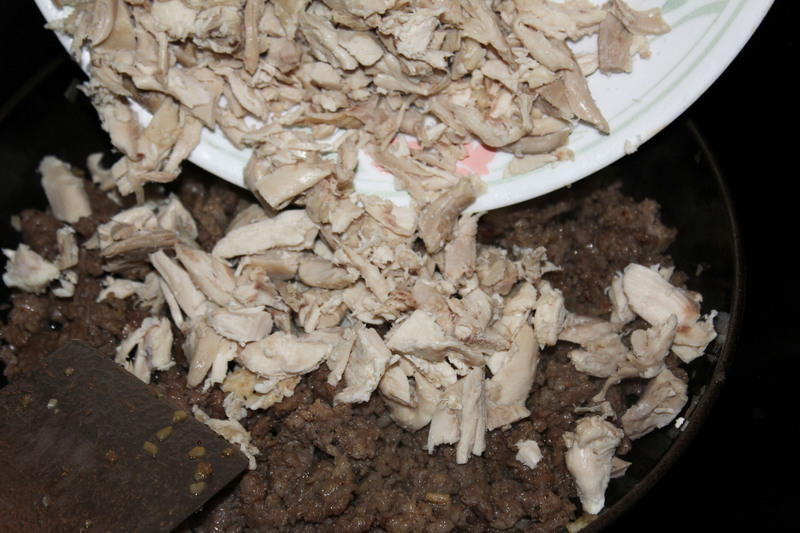 Add chicken pieces to cooked sausage. 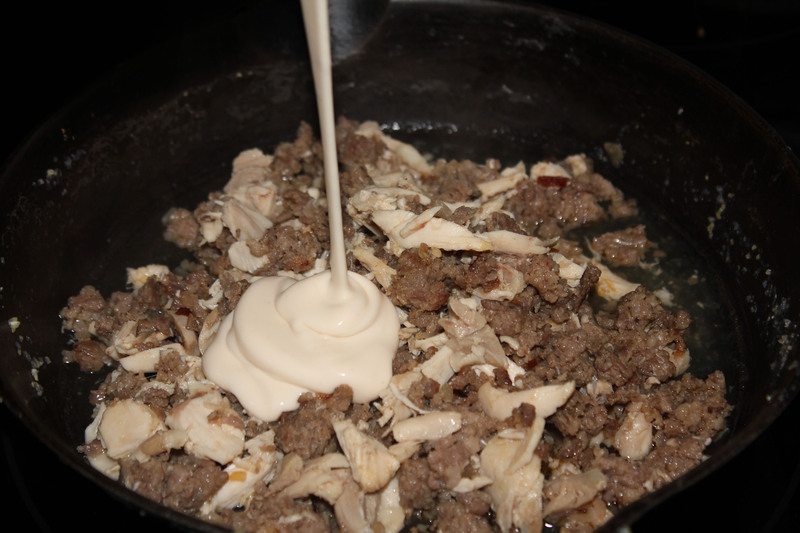 Add sauce to chicken and sausage. 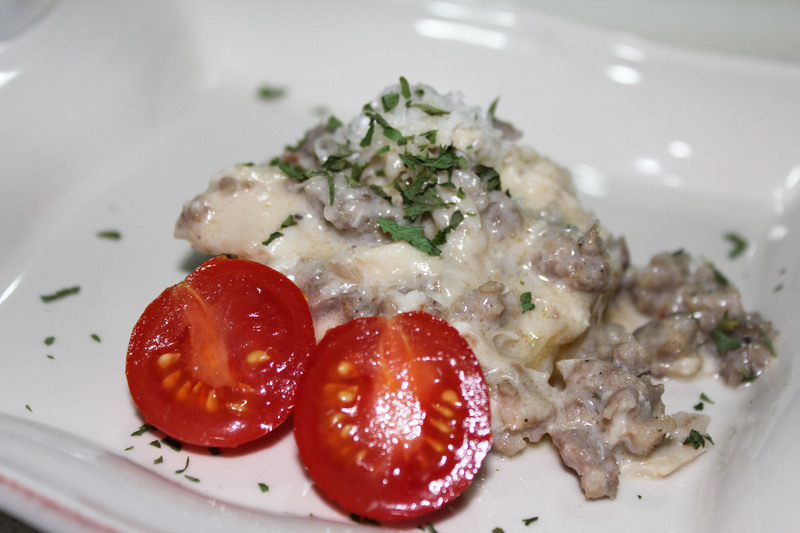 You can use tomato or white sauce - your choice! 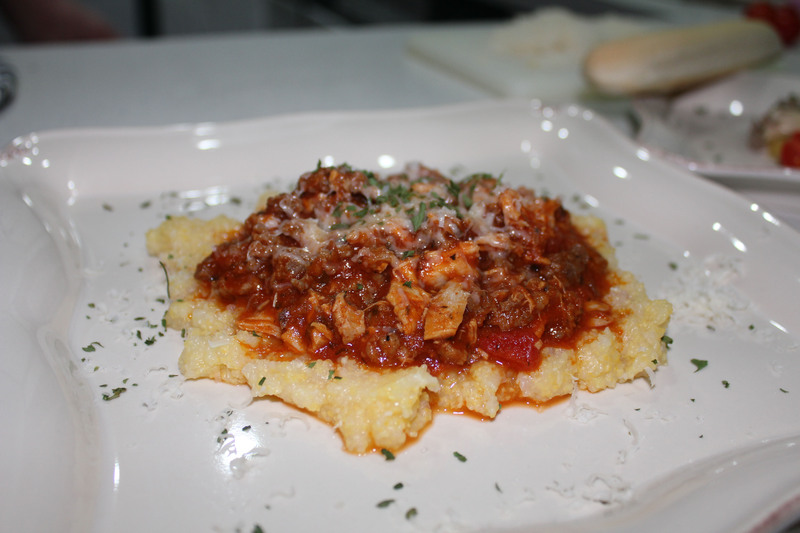 You can either slice the polenta and heat the slices or chop it up and simmer with chicken stock to make it smooth. I think I liked the smooth version best. 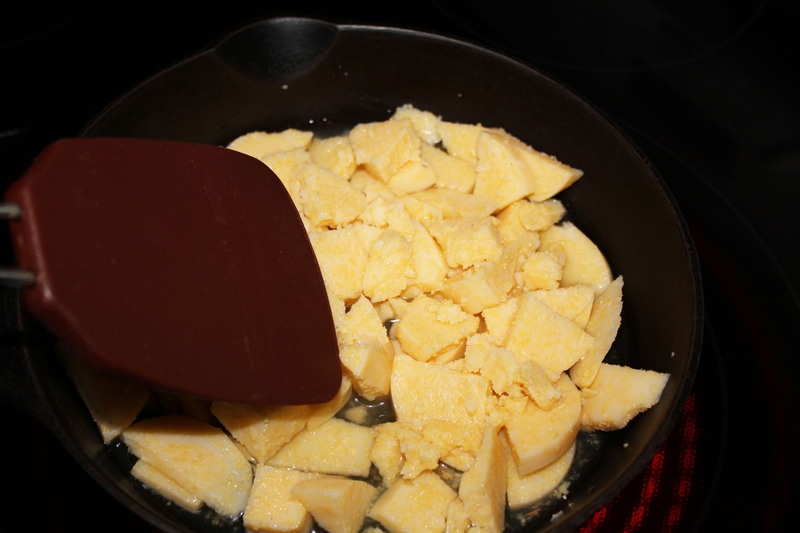 To get the smooth polenta, cook with chicken broth and butter until the liquid is absorved and the polenta breaks down. 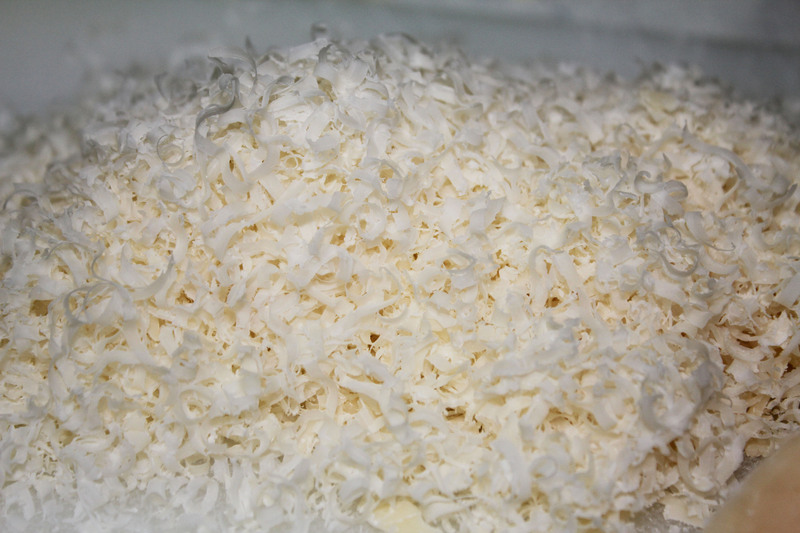 Freshly grated parmesan is absolutely fantabulous! In a heavy-duty skillet, brown the sausage. When it is cooked, add the chicken and alfredo sauce, along with a cup of the chicken broth and simmer about 10 minutes or until sauce starts to thicken. While the sausage is cooking, warm butter in a skillet. 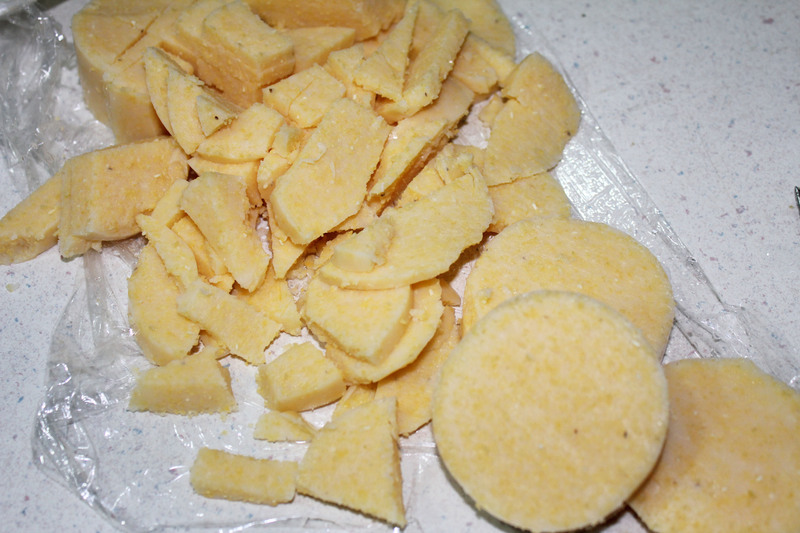 Slice polenta into slices about 1/2 to 3/4-inch thick. Place in the skillet and cook until heated through. Put slices on a plate and pour sauce over the top. 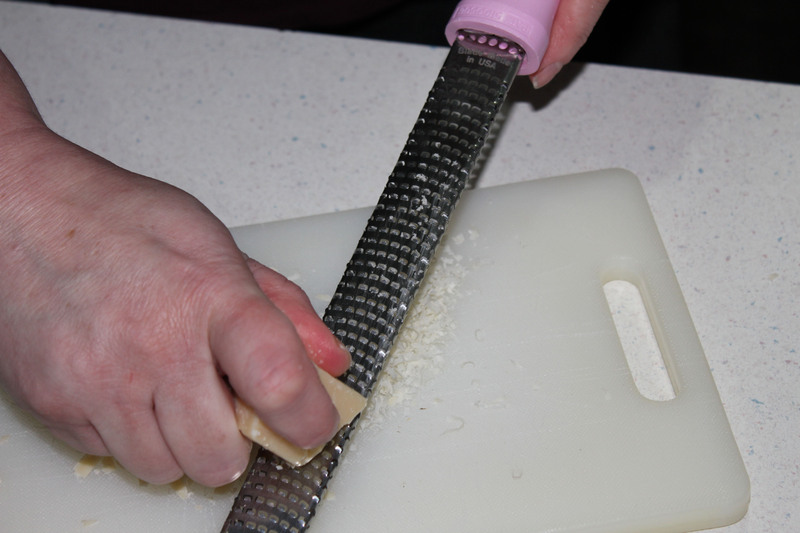 Sprinkle liberally with Parmesan cheese and, if you wish, a nice dash of parsley bits. In a heavy-duty skillet, brown the sausage. When it is cooked, add the chicken and tomato sauce and simmer about 10 minutes until sauce starts to thicken. While the sausage is cooking, break the polenta into small pieces and place in a skillet with a cup of the chicken broth and a tablespoon of butter. Simmer on medium heat until liquid is absorbed and polenta breaks down smoothly (about 10 minutes). Spoon polenta onto a plate and top with the sauce, then sprinkled with Parmesan Cheese and, if you like, parsley. See how easy that was? Super simple and super good. She Who Licked Her Plate Clean!